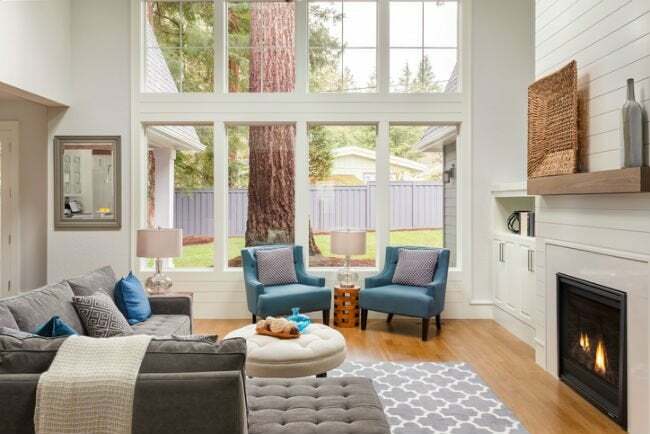 Both have their strengths and weaknesses, so run through these considerations when deciding which replacements—vinyl vs aluminum windows—are right for your home. Homeowners who are considering replacement windows have more choices in materials, finishes, and styles today than ever before to get a look that they love. While in the past most homes in the United States were constructed with wooden windows—and older homes can still be found with these charming if inefficient features—vinyl and aluminum windows have become the more popular choices for new installations and replacements. Both aluminum and vinyl are typically more durable, lower-maintenance, and less expensive than wood, but each material has its own plusses and minuses. If you’re choosing between vinyl and aluminum windows, you know this decision is not one that can be solved with a coin toss, either. New windows are a fairly pricey proposition, ranging from a low of about $375 up to more than $1,500 per window, according to industry estimates. Contractor referral website Angie’s List says that members report paying an average of $729 per replacement window, including installation. Add that up for every window in your home, and you could pay anywhere from $8,000 to $24,000—a lot of money on the line. You’re not just looking for one that fits the budget, but also evaluating what fits the bill for durability, maintenance, insulation, and more. To help shine a light on the right choice, we’ve laid out the seven big differences between these two popular types of windows. 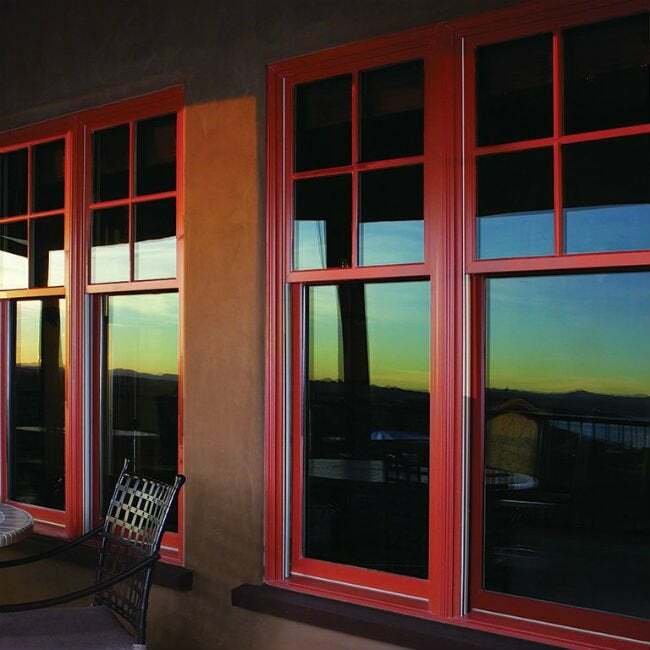 Keep reading for key considerations in the decision of vinyl vs aluminum windows. Vinyl frames are more traditional in appearance than aluminum frames. When considering style, vinyl and aluminum windows hit many of the same notes: Both are readily available as single- or double-hung, single- or multi-pane, and nearly any color or finish you could desire, depending on the manufacturer. That said, vinyl window frames are typically thicker than aluminum frames and offer options of smooth, textured, or faux wood finishes. In fact, the wood-grain texture achievable with vinyl windows is a big plus for homeowners who like the look of wood but long for the durability of newer materials. With aluminum frames, a wood look would be a mere coating essentially painted on and therefore does not typically appear quite so realistic. Thinner aluminum frames are typically finished in a smooth or textured powder-coated enamel for an ultimately sleeker, modern appearance that is more conducive to fitting in with contemporary architectural styles. Aluminum frames are more prone to dents, corrosion, and fading. Both types of windows are very resistant to scratching, cracking, and marring. Vinyl windows, however, boast extra durability when it comes to dents and chips, too. In the rare circumstances that your frames were to be damaged, vinyl frames—which are constructed of the same material all the way through—would be less likely to show any chips or scratches than aluminum frames, where any damage to the finish will expose the raw metal underneath. Aluminum can also face challenges of corrosion and color change. Over time, the steel or zinc fasteners used for aluminum windows will corrode and pit, especially in environments like coastal towns with salty air. The enamel finish on aluminum windows is more subject to fading in strong sunlight than the dyes used in vinyl construction. …but aluminum frames are stronger overall. If a home has extremely large windows, aluminum frames are generally used. Their strength and structural integrity make them ideal for handling the larger sizes. This strength also translates to a higher degree of impact resistance—key for homeowners who live in the path of frequent hurricanes. While there are impact-resistant vinyl windows available, these typically cost 20 to 30 percent more than impact-resistant aluminum windows. Vinyl windows require less maintenance than aluminum windows. Vinyl is virtually maintenance-free (though homeowners may need to do some caulking to prevent airflow in and around the material if the windows haven’t been installed correctly). Aluminum windows aren’t too much more work to maintain, all things considered. Since they are prone to condensation—which can lead to rust or mold—aluminum should be cleaned with a special aluminum cleaner, rinsed, and dried semi-regularly. Also be proactive about lubricating the moving parts to prevent undue wear and tear on the metal mechanisms. Vinyl never requires repainting; aluminum can be repainted or re-coated. In general, when shopping for replacement windows, it is a good idea to choose a color and finish that you can live with, whether you choose vinyl or aluminum. Many paints and coatings will not adhere well to either material and will be prone to peeling and flaking. Because vinyl is the same color throughout, there is seldom any need to repaint—in fact, repainting vinyl windows often will void the warranty. Scratched or chipped aluminum can be repainted or re-coated with enamel paint, but it may be difficult to exactly match the original finish. Vinyl windows insulate better than aluminum windows. Vinyl windows excel when it comes to insulation and improving energy efficiency because the vinyl material minimizes heat transfer. Aluminum windows tend to conduct heat (and cold) and, therefore, are less energy efficient. You may look for more advanced aluminum options labeled “thermally improved,” or install special “thermal breaks”—insulation within the frame to prevent thermal energy loss—which just happen to be made of vinyl. When seeking maximum energy-efficiency, look for ENERGY STAR-qualified windows, which can lower your energy bill by an average of 12 percent annually. Vinyl windows are less expensive than aluminum. Industry estimates vary, but vinyl windows generally cost 30 percent less than comparable aluminum windows. On average, homeowners can expect to pay about $3,156 for six vinyl replacement versus about $4,668 for six aluminum replacement windows—and that’s before factoring in the cost of labor. Contractor referral website Home Advisor says the average national cost of window installation is $5,026, with most homeowners spending between $2,583 and $7,482, according to actual project costs reported by HomeAdvisor members. Replacing your windows may have an unexpected but strong upside if you are looking at your home’s resale value, however: An upscale vinyl window replacement costing $15,955 will return 74.3 percent of its value upon resale, according to Remodeling Magazine’s 2018 Cost vs. Value Report published by Hanley Wood LLC. 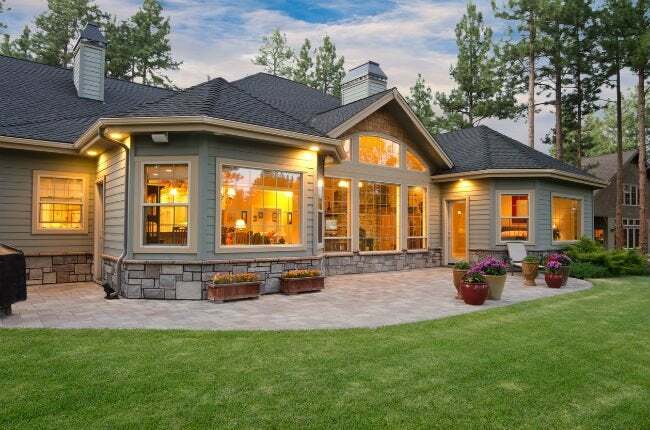 Regardless of which option you choose—vinyl or aluminum—replacement windows can be viewed as an investment in preserving the overall value of your biggest asset: your home.